This article originally appeared on the Climate and Clean Air Coalition website. In 1998 Beijing declared war on air pollution. The challenge was to find ways to improve air quality in one of the largest and fastest growing cities in the developing world. 20 years on and it appears that Beijing is winning the battle. Air quality has improved substantially, and the lessons learned provide a roadmap for other cities tackling air pollution. A new report by the United Nations Environment Programme (UN Environment) and the Beijing Municipal Ecology and Environment Bureau (BEE) outlines how Beijing’s air quality management programme has evolved over the past quarter century and makes recommendations for near, medium, and long-term steps that Beijing can take to maintain its momentum toward clean air. In 1998, air pollution in Beijing was dominated by coal-combustion and motor vehicles. Major pollutants exceeded national limits. Over the next 15 years Beijing implemented a series of measures focused on energy infrastructure optimization, coal-fired pollution control, and vehicle emission controls. By 2013 levels of air pollutants had fallen (see graph below) and some pollutants, like carbon monoxide and sulfur dioxides, met national standards. In 2013 Beijing adopted more systematic and intensive measures for air pollution control. By the end of 2017 fine particulate pollution (PM2.5) fell by 35% and by 25% in the surrounding Beijing-Tianjin-Hebei region. Much of this reduction came from measures to control coal-fired boilers, provide cleaner domestic fuels, and industrial restructuring. 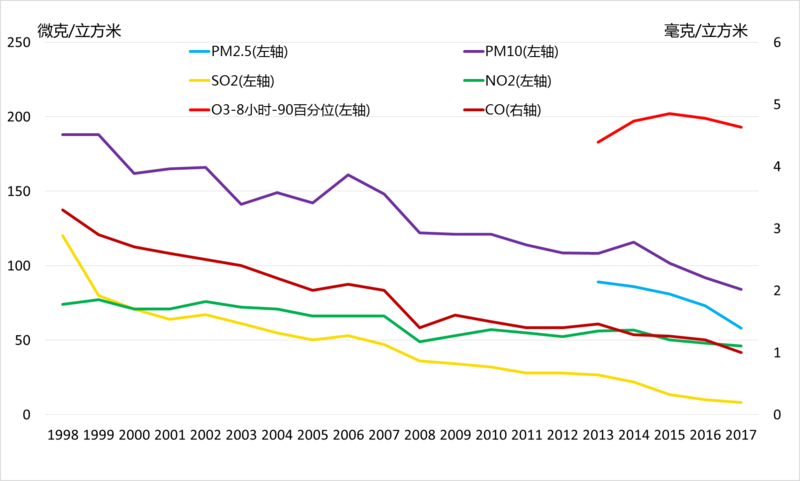 Over this period annual emissions of sulfur dioxide (SO2), nitrogen oxides (NOx), particulate matter (PM10) and volatile organic compounds in Beijing decreased by 83%, 43%, 55% and 42% respectively. The publication of the report was supported by the UN Environment hosted Climate and Clean Air Coalition. A video highlighting Beijing’s high density grid air quality monitoring was played at the launch of the report. Banner photo by the Climate and Clean Air Coalition.